Globally, 40 percent of fisheries are in deep trouble with overfishing being the single biggest cause. Yet, Jane has shown how we can replenish life in the oceans through smart approaches that include better science, more marine protected areas, and stewardship incentives for fishermen. As the first female administrator of the National Oceanic and Atmospheric Administration 2009-2013, Jane took the helm in the midst of shrunken budgets, a crippling recession, a polarized Congress and a changing climate. It was also a time when tensions between fishermen and regulators reached an all-time high. Despite these challenges, she oversaw the rapid turnaround of long-ailing American fisheries, embracing fishermen incentives as a way to turn conflict into cooperation, and to reverse fragile collapse into a resilient ecological recovery. Partnerships with fishermen are also a pillar of the ocean work we do here at Environmental Defense Fund, where Jane is now serving for the second time as a member of our Board of Trustees. One of several significant ocean victories for which her leadership can take part of the credit was the spectacular recovery of the Pacific groundfish fishery. It was reformed with dramatic results after having been declared a national disaster just years earlier. Today, this fishery provides 250 million pounds of certified sustainable fish to markets, enough to feed 17 million Americans wild seafood for an entire year. In fact, the U.S. has continued to boost fish populations over the last three years, while increasing fishing industry jobs 23 percent and fishermen revenues by 30 percent. This offshore transformation benefits shoppers at HEB and Whole Foods, and has earned progressive certification by the Marine Stewardship Council and elevated status by the Monterey Bay Aquarium’s Seafood Watch. But the problem of overfishing is not limited to our shores. Like Jane, we envision the world’s oceans once again abundant with fish. They should be part of a thriving and diverse marine ecosystem that supplies people with an increasing amount of protein-rich food while supporting thriving coastal communities. Our goal is to help catalyze reforms, making sustainable fishing the norm in 12 governments that account for nearly two-thirds of the global catch. 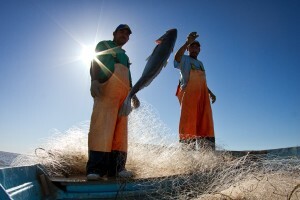 Reforms at this scale will help sustainable fishing take hold worldwide. That’s why this appointment puts the right person with the right ideas in the right place at the right time. Our new Science Envoy for the Ocean brings a wealth of expertise and experience that can be helpful to fisheries ministers, practitioners and scientists in America and beyond. In her new position, Jane can help bring the best scientific understanding and practical solutions for getting more fish in the sea, more food on the plate, and more prosperous communities around the world. This entry was posted in Domestic, International, Science/Research and tagged fishery recovery, global fisheries, Jane Lubchenco, ocean optimism, science, science envoy, State Department. Bookmark the permalink. Both comments and trackbacks are currently closed.